It’s hard to believe that so many years have passed since this movie first came out and that it has now been re-released. Prior to the advent of computer generated animation, a special effects technique known as stop motion animation was used to create the mythological creatures in the movie. Clash Of The Titans is an adaptation of the Greek myth of Perseus and his quest to destroy both the Gorgon, Medusa, and the Kraken sea monster to save princess Andromeda. The storyline in the movie is rather different from the original myth – but then, movies usually are. Laurence Olivier as Zeus, Ursula Andress as Aphrodite, Harry Hamlin as Perseus and Claire Bloom as Hera were amongst the stellar cast. Although many people are familiar with the original movie and have probably seen it, not many people know that a portion of the movie was filmed on the island of Gozo (one of the three major islands that make up the Maltese archipelago). 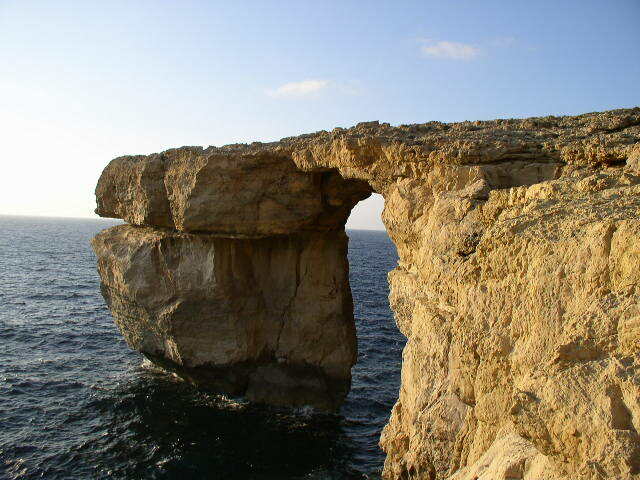 The scene below, with the Kraken rising out of the sea, was filmed at the Azure Window, one of the most recognisable landmarks in Gozo. The clip is a bit long but you can see the Azure Window at 1:19. I watched this movie a lot as a kid. I remember the first time we viewed it, we convinced my uncle who was babysitting us to 'pretend to be our parental guidance' since the movie was rated PG.